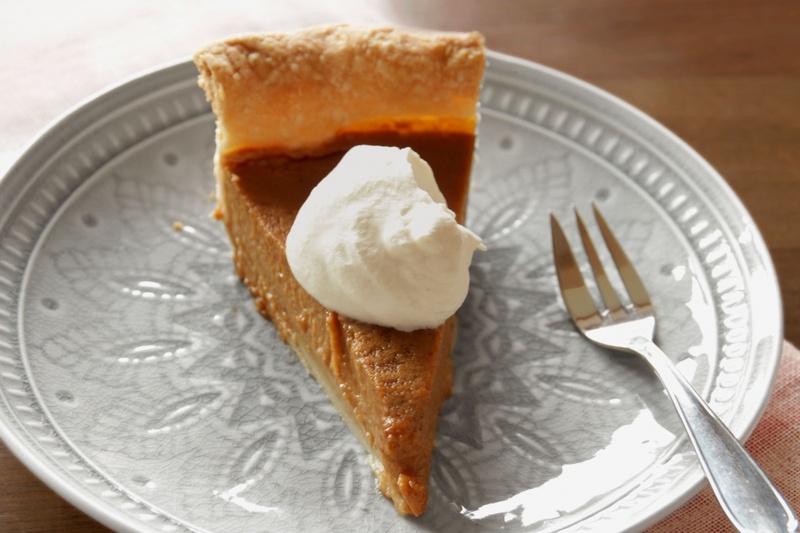 Here’s a twist on the traditional, homemade American Pumpkin Pie. Chai Spiced Pumpkin Pie. The flavors of the spices are kicked up a bit and cardamom is incorporated in the mix. Chai Spiced Pumpkin Pie still tastes like pumpkin pie, just better. I’ve got you covered with recipes for the crust, the homemade pumpkin puree, the custard filling and, to make it extra special, cardamom whipped cream. The cardamom whipped cream is heavenly. You’re going to want to put it on everything. Here it brings out the cardamom in the pumpkin filling. If you’d rather use a store-bought pie crust or canned pumpkin puree, feel free. Here in Austria, we don’t have that option so I’ve figured out how to make it all myself. Personally, I think it’s worth the effort for a special occasion. It seriously doesn’t get any better than homemade. The pumpkin puree made fresh from roasted squash or pumpkin makes a huge difference in flavor. I’ve seen recipes that call for roasting canned pumpkin puree to get the same flavor, but if you’re roasting the pumpkin anyway, why not try roasting a fresh squash or pumpkin? 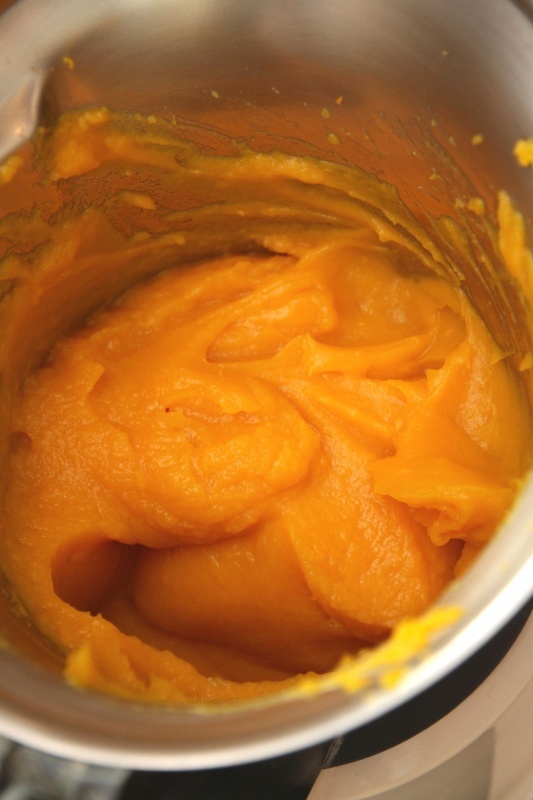 It’s super easy, for directions take a look at How to Make Your Own Pumpkin Puree. My recipe for homemade Buttermilk Pie Crust makes enough dough for two custard pies. You can either make two pies and freeze one if you don’t need it, or you can freeze the extra dough for next time. I made a tutorial for you showing how to make Buttermilk Pie Crust from scratch. The dough is easy to work with, is elastic and always comes out perfectly. It also doesn’t get too dark around the edges while the pie is baking. It is the best and most delicious crust – tender and flaky. Making your own Pumpkin Puree is as easy as pie! Heat the oven to 350°F (170°C). Cut the pumpkin or squash in half lengthwise and, using a spoon, scrape out the seeds and stringy bits. Lay the pumpkin halves on a baking sheet, cut side down (or up, it doesn’t matter). Roast the pumpkin in the oven for 40-60 minutes, depending on the size, until a fork can easily be stuck into thickest part. Remove from the oven and allow the pumpkin to cool for about 1 hour, cut side up. Scrape the flesh from the skins and plop it into a food processor or blender. Puree until mixture is perfectly smooth. If it doesn’t puree easily, add 1 or 2 tablespoons of water. Measure 2 cups (15 ounces or 450 g) puree for the pie and set aside. 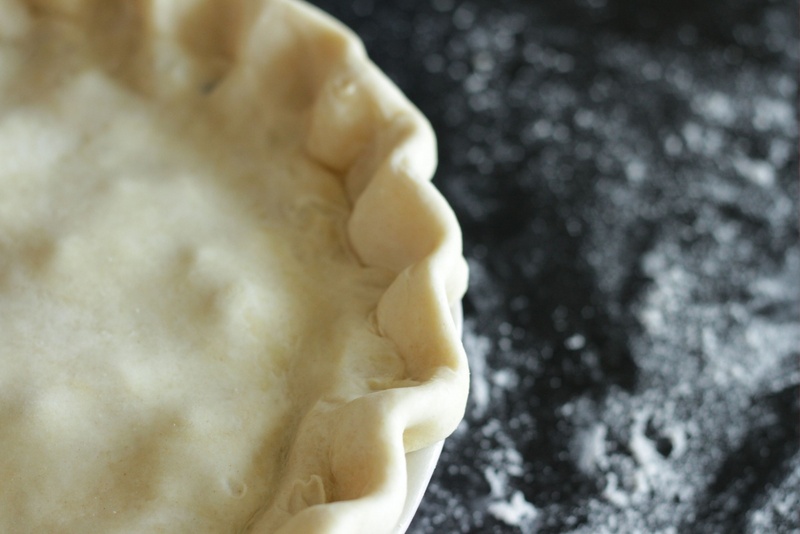 An elastic pie crust that doesn't tear, is easy to work with, and always comes out perfectly. Recipe from Betty Crocker's Cookbook. Stir flour and salt together in a large bowl. Using a pastry blender, knives or your fingers, cut in margarine and butter until clumps are the size of small peas. Drizzle in oil and buttermilk, stirring with a fork. Turn dough onto work surface and gently bring dough together with your hands, kneading only once or twice until you can shape it into a ball. Dough should appear somewhat rough and streaked – this ensures it will be tender and flaky. Cut the dough ball in half and wrap each half in a disk shape in plastic wrap and place in refrigerator to chill for 30-60 minutes. If you are making one single-crust pie, freeze the other dough disk in a zip-lock bag for the next time you make pie. Roll pastry on a well-floured surface with a floured rolling pin, rolling from center to outside edges in all directions. Turn pastry clockwise often to make sure it isn’t sticking to surface and use more flour if necessary. When dough circle is large enough to line bottom and sides of tart pan or pie plate, roll pastry around rolling pin and transfer it to the pan. Unroll pastry over pie plate or tart pan and ease it down the sides to make sure it is covering bottom and sides without being stretched. Using clean kitchen shears, trim overhang to about 1 inch (2.5 cm) and use scraps to patch any areas where there is too little dough coverage, pinching the dough into place. Fold edges under, and press dough edges together with your fingers all around the pie plate, building up a rim. 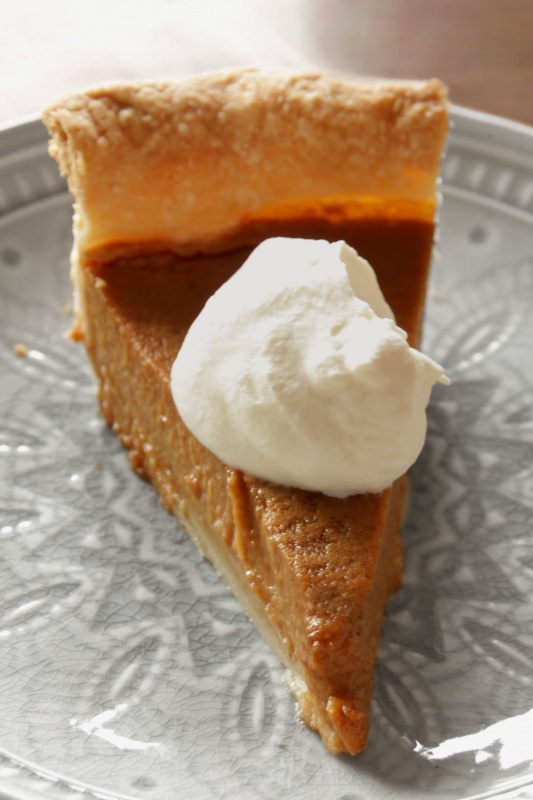 Pinch a fluted pattern into the edges all around the rim of pie. Fill pie shell and bake according to pie recipe. The flavors of the spices are kicked up a bit and cardamom is incorporated in the mix. Chai Spiced Pumpkin Pie tastes like pumpkin pie, just better. Prepare Pumpkin Puree and set aside. Prepare Pie Crust and line pie plate with crust, set aside. Preheat oven to 400°F (200°C). In a large mixing bowl, beat eggs, brown sugar, salt and spices until combined. Blend in pumpkin. Add milk and beat until combined. Pour into pie shell. Bake for 10 minutes, then reduce heat to 350°F (180°C) and bake for an additional 35-45 minutes, until it is set to the touch and no longer jiggles. Cool completely on a wire rack. Serve at room temperature or chilled, topped with Cardamom Whipped Cream, if desired. To make Cardamom Whipped Cream: Beat cream, sugar, vanilla and cardamom on high until soft peaks form. Store pie tightly covered in refrigerator for up to three days. Pumpkin Pie may also be frozen in a heavy-duty ziplock bag for up to two months. Recipe adapted from Festal Pumpkin. **UPDATE: To make traditional Pumpkin Pie filling (not chai-spiced), reduce cinnamon to 1 teaspoon and omit the cardamom.